The Youth Services department is located on the first floor of the library. Mon-Fri, 9 AM - 9 PM, Sat, 9 AM - 5 PM, Sun, 1-5 PM. 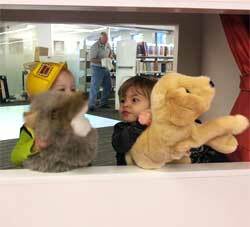 Visitors to our library will discover an exciting and very interactive Youth Services department, unlike any other they have experienced. We love showing families around and talking with them about the thoughtful planning and design behind our Youth department. 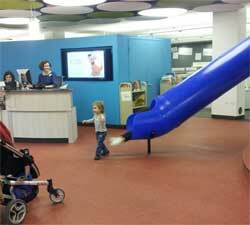 Read on and learn more about this amazing space for kids and young teens! Helping kids grow and develop also means giving them an opportunity to engage in play. 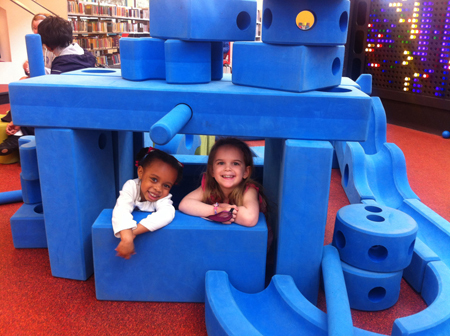 Play encourages cognitive development, literacy skills, social awareness and motor development. Active play helps in improving coordination, self-esteem, social skills, physical body systems, and thinking skills. 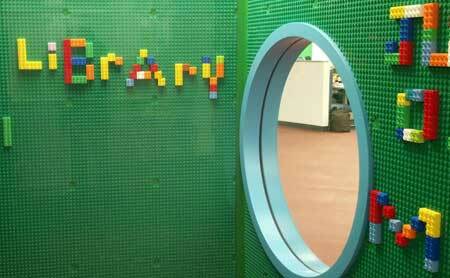 All of these things help create successful readers and learners - so we created a new Youth Services space that encourages learning through play. Using chalk on a vertical chalkboard helps develop arm and hand skills that lead to writing, while encouraging inventiveness, creativity, graphic awareness, problem solving and social interaction (“Look what I made!”). Drawing with chalk helps promote the “tripod grasp” needed for efficient writing. For toddlers, scribbling is the motor form of “babbling.” The magnet board activities encourage literacy, motor, and storytelling skills, as well as phonemic awareness and alphabet letter knowledge. Additional activities can teach math skills, spatial relationships, and geometric concepts. There are many benefits for kids who engage in real, dramatic or theatrical play. Acting out new or familiar stories gives them insight into narrative structure and points of view. Role-playing encourages empathy as kids learn to see through someone else’s eyes and experiences. 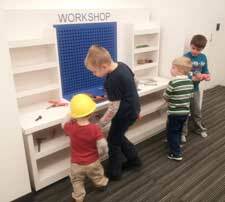 Pretend play introduces new vocabulary and social interaction as children engage with others. This type of play fosters cognitive development through problem solving, mental planning (“Wow, are we going to play spaceship?”), self-monitoring, and evaluation. A puppet theater gives kids freedom from inhibitions and encourages speaking and listening skills. On stage, theatrical play develops public speaking skills and the ability to express different emotions, provides opportunities to role-play various life events, and helps to develop the imagination while strengthening spatial and kinetic skills. DUPLO blocks and the Imagination Playground pieces encourage loose parts play. Loose parts play develops logical and mathematical thinking skills through actions such as counting, classifying, and estimating. Kids stimulate their imaginations by developing stories and turning abstract materials into concrete objects. Building specific projects develops problem solving skills and building with others encourages social communication skills such as negotiating, blending ideas, and more. In addition to the stage and puppet theater, the new playhouse has stairs, a viewing tower and a slide. Incorporating a slide into our space provides a movement experience that encourages spatial awareness, core stability, balance, and leg and hip flexibility. In addition, using a slide stimulates the vestibular system (important for balance and coordination), which is important for a child’s development. The playhouse stairs also foster whole-body muscular strength, flexibility, and the sense of proprioception, the awareness of body position. Beyond providing experience with the Apple iPad, apps selected for the library provide literacy skills, information awareness, and graphic knowledge. Using the iPads can be a solo activity or it can involve friends and family. iPads loaded with appropriate apps are available for varying ages of children. Kids can become familiar with the latest Microsoft operating system in a touchscreen environment. Apps selected for these workstations encourage art, music, drawing, coding and creative exploration. 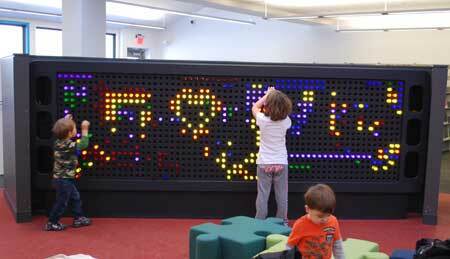 This large version of the classic children’s toy encourages young artists to create while supporting pattern recognition, sorting, motor skills, collaborative play and parent/child play. 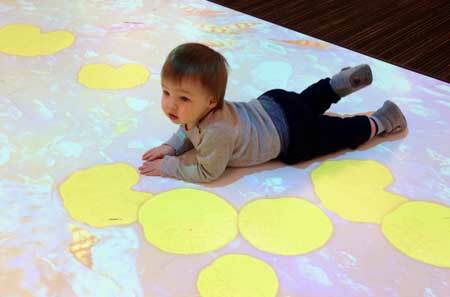 Interacting with the digital pond provides an opportunity to experience cause and effect relationships while encouraging small and large motor skills. When people move towards the fish, they swim away. If people stand still, the fish draw near. Words and images fall from the sky as visitors use their shadows to interact with them. 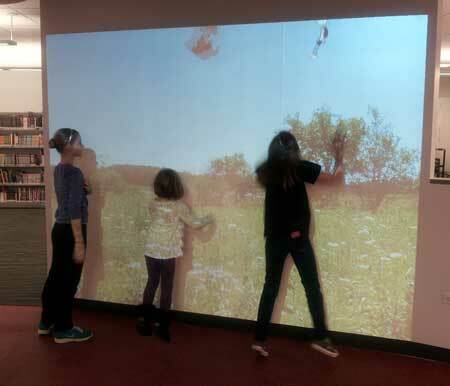 Kids interact with words and images, learning how their movements, shadows and distance from the wall affect the objects. Kids in 8th grade and younger can reserve the game room to play video or board games with friends or family. The room may also be reserved by children to use as a study area. Not only are games fun, they can also enhance math, reading, thinking, and social skills. Learn more about the Game Room. Kids in 8th grade or younger can reserve this digital creation studio to create and edit videos, photos, audio files, presentations and more. Learn more about Studio Kids. What is Dramatic Play and How Does It Support Literacy Development in Preschool? Why Use Drama Games or Theatre Games? Self-control? It's child's play. Some classic games help limit anti-social behavior.